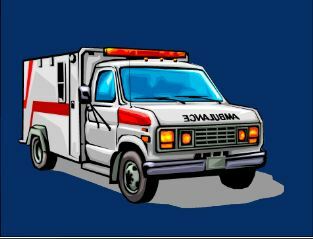 Finally – Safe Transport for Kids in Ambulances…Thanks NHTSA! “BEST PRACTICE RECOMMENDATIONS FOR THE SAFE TRANSPORT OF CHILDREN IN EMERGENCY GROUND AMBULANCES” …Thank you NHTSA!! The working group outlined 5 potential child transport “Situations” (see chart below) and for each described their “Ideal” solution – the best practice recommendation for safe a safe transport for each situation. They also presented an “If the Ideal is not Practical or Achievable” alternative – basically an “acceptable” backup plan. They also came up with guidelines to assist EMS providers in selecting a child restraint system – particularly important because due to the lack of regulation and testing requirements specific to ground ambulances, many of the available child restraint devices were not designed for use in ambulances, some were tested to automotive standards and others were not tested at all. In the end, the ultimate goal of ALL the recommendations: Prevent forward motion/ejection, secure the torso, and protect the head, neck, and spine of all children transported in emergency ground ambulances. In short – transport these children safely. “It is hoped that the recommendations provided in this report will address the lack of consistent standards or protocols among EMS and child passenger safety professionals in the United States regarding how to most safely transport children in ground ambulances from the scene of a traffic crash or medical emergency to a hospital or other facility. 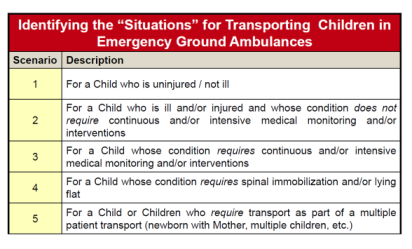 It should be noted that the expectation is that States, localities, associations, and EMS providers will implement these recommendations to improve the safe transportation of children in emergency ground ambulances when responding to calls encountered in the course of day-to-day operations of EMS providers. In addition, it is hoped that EMS providers will be better prepared to safely transport children in emergency ground ambulances when faced with disaster and mass casualty situations”. …. Amen to that !! Congratulations to Stefanie and Pediatric Medical. This has been a pursuit that has lasted over ten years and is a landmark victory in her quest. Thanks so much Jim! The victory is also for you…and for all the EMS folks who have been fighting for this for years…and for the kids who will be safer because of them! Thanks for caring so much!! Stefanie, not only is this a hard-fought victory for you, this is a victory for any child who needs to be safely transported for ANY medical reason by ground ambulances. Thank you NTHSA for bringing together all the responsible groups who can make an effective change in the way infants and small children can be carried (and treated in transit if necessary) by EMS crews. My hope is that these new guidelines will be implemented as quickly as possible, to be put in place and in use with the proper medical equipment, so that our youngest population can be protected when they are the most vulnerable position. God forbid my children ever need an ambulance but it’s reassuring to know they’ll potentially have a safe ride! I know…it’s a huge step in the right direction. And though we still have a long way to go to make ambulance travel truly safe for kids, you gotta start somewhere…and this is a biggie. Saying hi from our SITS tribe! My son had an unexpected ambulance ride last year and I never even considered that it might not be safe for him! Thanks for sharing.